The Modmic is a flexible, high-quality boom mic for your PC communication needs that works with any set of headphones. So you're into gaming, which means unless you're a gaming hermit, you're probably communicating with your friends and other gamers via some sort of "gaming" headset. I never understood the word "gaming" for computer peripherals—they're usually reserved for products that have ugly designs, with some exceptions. The most popular product categories to fall into the "gaming" pile are headsets, and the majority of them are not made with the best quality components. The microphone is usually terrible, or the audio is awful, or both. For the most part, 95 percent of headsets out there are pretty terrible, and if I were reviewing them, most would score a 6 out of 10. Yeah, that's a failing grade—pretty brutal. Probably the one gaming headset exempt from my scathing remarks would be Kingston's HyperX Cloud Gaming headset. It has relatively good audio, has a good microphone, and is comfortable to wear for long gaming sessions. But I still wouldn't use it for listening to music. What if you've already got a great pair of headphones sitting around and you want to use them for gaming? That's a great question. My advice is to use a product called Modmic by Antlion Audio. It's a very high-quality boom microphone that can be purchased in either omni-directional or uni-direction configuration, with or without a mute switch. The Modmic, by Antlion Audio. 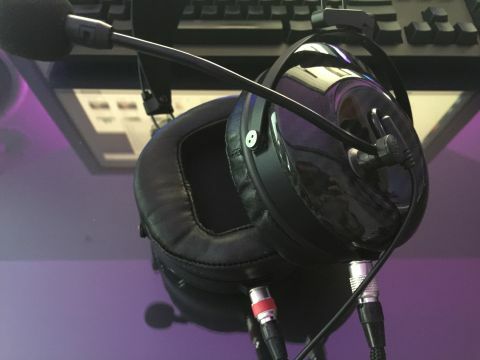 I have been recommending the Modmic to many friends and readers, as it's the best way to get great audio with a great microphone. No "gaming" headset can beat a great set of headphones in audio. This is especially true if you have an ounce of interest in the quality of your audio output for games and music. The difference can be night and day. Many readers seem to like using Sennheiser's headphones at their desk, especially the HD 598 or the HD 600. Other brands appear to be popular as well, including Audio-Technica, HiFiMAN, AKG, and Beyerdynamic. Then there are the other more boutique brands like Audeze, Fostex, Master and Dynamic, MrSpeakers, Oppo, Stax, etc. If you're familiar with any of these, and you've been looking for a way to add a microphone, look no further. Adjustable magnetic attachment;omes with 2 nubs. Strange use of the Modmic. Weirdo! Once attached, the link itself can be rotated in any direction. Perhaps you have a really short or really big head, and can't find a headset that suits your size. Or maybe you prefer your mic on the right instead of the left. Position the attachment nub anywhere you want; problem solved. Some users even attach a nub to the frames on their glasses. Bizarre! Build quality is excellent, and the Modmic arm is easily adjustable so you can get the best positioning. Speaking with several people who own Modmics, they prefer using the uni-directional Modmic over the omni due to the omni picking up surrounding noises, like loud mechanical keyboard typing. The uni-directional Modmic is sensitive to your voice, but it isn't sensitive enough to pick up sounds that will annoy your buddies. The Modmic is exceptionally clear in audio performance. In our tests, it's better than just about any other integrated mic on any gaming headset—even the HyperX. The best part of it all is it's easily stowed away when not in use. Good case to protect your Modmic. Getting back to the dual nubs, let's talk about other reasons people might like using two different sets of headphones. During our talks with users, many audio enthusiasts like having one closed set of headphones, and another set that's open. Most headphone reviewers say the same thing. In FPS games especially, or other games with an emphasis on environmental acoustics, an open-back headphone can produce a more convincing environment, which helps to determine direction from audio cues. On closed-back headphones, the sound is more centered within your skull, and many like this focused sound when listening to music. Depending on how you like your audio and what you listen to, having both kinds of headphones is a great thing. The Modmic is a simple and elegant solution for anyone requiring mic input. Pair it with your favorite headphones and ditch the world of poor mic, poor audio, poor quality "gaming" headsets. During gaming sessions, our friends easily heard the quality difference between headsets from companies like Corsair, Logitech, and Razer compared to the Modmic. Attached and ready for action! The Modmic Omni-directional muteless starts at $43, and a uni-directional with mute switch goes for $50. If the pricing seems a bit steep, it is—at first. Then you realize the quality of audio you're broadcasting is amazing, the flexibility it provides, and that you can take your mic with you should you decide to upgrade cans. Suddenly, the price isn't a deterrent, but it's a bargain instead—especially when you consider pro-level mics can get into the thousands of dollars. On the flip side, this is all in service of your friends (or for doing streaming sessions), since you don't have to listen to yourself. So if you don't care what your friends are hearing, maybe any old headset will do. But at least get a good pair of headphones!